Product #60592 | SKU CONVN8TRM/AA/SDIH | 0.0 (no ratings yet) Thanks for your rating! A deposit of $220.00 is required for this pre-order. 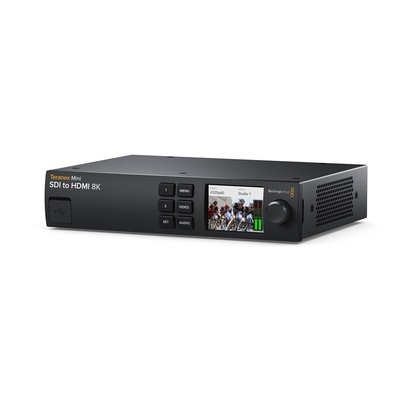 The Blackmagic Design Teranex Mini SDI to HDMI 8K is an advanced 8K monitoring solution for large screen televisions and video projectors. Unlike basic converters, Teranex Mini SDI to HDMI 8K HDR can use third party calibration probes to accurately align connected displays for precise color. There are 2 on-screen scopes that can be selected between WFM, Parade, Vector and Histogram. Teranex Mini SDI to HDMI 8K HDR is perfect for film studios and broadcasters who need professional but affordable color accurate monitoring. Customers also get an elegant design with color LCD for monitoring and control of settings.